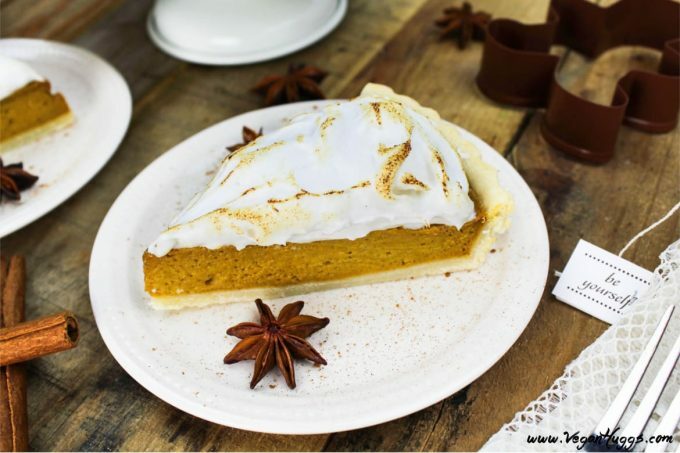 Put a little twist on tradition with this Vegan Pumpkin Meringue Pie. It’s creamy, dreamy and gorgeous! It’s so easy to make & calls for simple ingredients, too. Well, here I am again today – I made it just in time for the big day tomorrow. Yay! I just posted this delicious Mashed Potatoes & Gravy recipe yesterday, and now, I’m here to present to you, the grand finale to my Thanksgiving recipe collection. 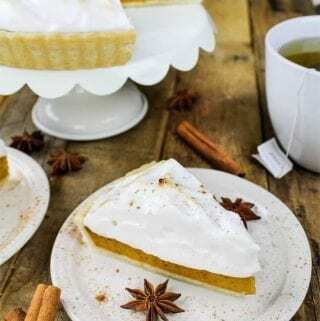 Enter – Vegan Pumpkin Meringue Pie. Doesn’t it look heavenly? Pumpkin pie is a must on Thanksgiving, right? Of course, that’s a silly question! So why not kick it up a notch and go for this meringue version? I know it looks time-consuming & difficult, but I promise, it’s not hard to create and it’s out-of-this-world delicious! I never thought I could enjoy meringue again as a vegan, but the vegan fairies have gifted us with a magical ingredient that creates the same fluffiness that egg whites do. It’s – wait for it…wait for it…chickpea brine! In the vegan world, we know it as aquafaba. It sounds fancy and all, but it’s just that water we’ve dumped down the drain for years! Can you believe it? Now, I promise you will not taste bean flavor in your meringue. The sugar takes care of that, which is the same for the egg white version. This vegan meringue topping is pillowy, fluffy, airy and just gorgeous to look at. I could seriously dive into a vat of this stuff, (total Willy Wonka-style) and never come back. Couldn’t you? I’m not the smarty pants behind this incredible discovery, and I learned how to make this vegan meringue from an ever-growing Facebook group dedicated to aquafaba recipes only. It’s a place that is seriously somewhere over the rainbow. It’s crazy what can be created with bean water! Meringue is really not hard to make, you’ll just need a stand mixer or a hand-held electric mixer. I wouldn’t attempt it by hand because you might not be able to move your arm afterward. For the remaining ingredients, you’ll need vanilla extract, sugar & cream of tartar (or xanthan gum). Now the cream of tartar isn’t 100% necessary, it just helps the meringue hold its shape better. That’s all you’ll need to create this fluffy goodness! I bet you have everything you need right now. You should take a peek…I’ll be right here when you get back. Oh, let’s talk about those little-scorched edges – they came from this fabulous kitchen torch. It’s a handy little thing to have around the house. If you don’t have one of these gadgets, you can use the oven to lightly toast the meringue. You can also just leave it plain – it’s just as delicious and perfect without it. 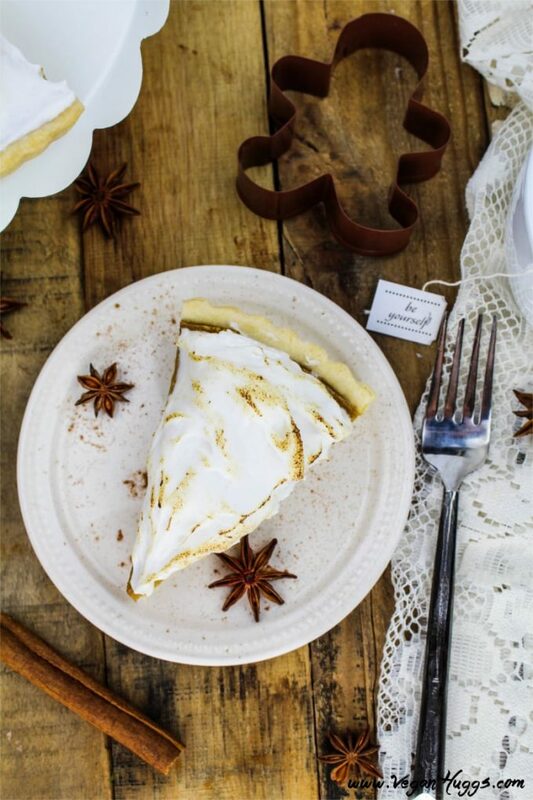 If you aren’t feeling fancy, you can forgo the meringue all together, and stick with the traditional pumpkin pie. This recipe is simple, classic and requires little effort & few ingredients. 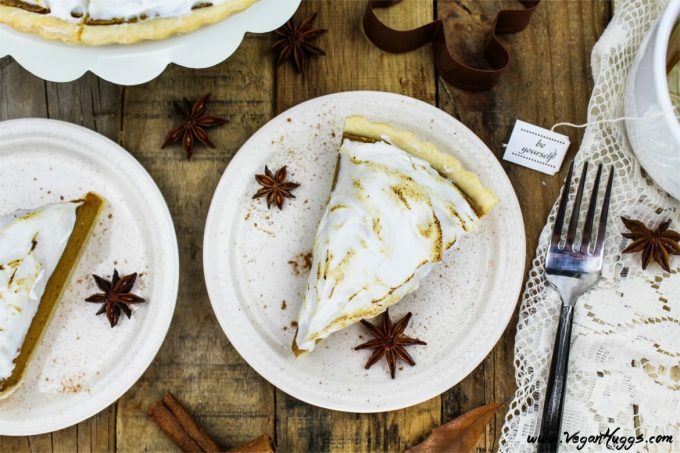 This delicious pumpkin pie makes a statement all on its own – it’s creamy, smooth, fall-spiced and pumpkin-y. Just how a pumpkin pie should be. Pair a slice with some vegan whipped cream, ice cream or go all out, and enjoy it with this Pumpkin Spice Latte. There’s no such thing as too much pumpkin, especially on a holiday, so go for it! If you’ve never made your own pie crust, you might want to give it a try. It’s so much easier than it sounds. You’ll just need some flour, water, vegan butter, salt & sugar. It will come out of the oven perfectly flaky, buttery and golden-y. If you aren’t into making the crust, you can pick up a pre-made vegan one from your local grocer. Don’t worry, your secret is safe with me. To make life easier, you can make this scrumptious pie 1-2 days before the big day, and store in the fridge. When you’re ready to serve up this deliciousness, take it out of the fridge, and start making the meringue about 10-15 minutes before. Easy-peasy! Ok, folks, this concludes the 2016 Thanksgiving portion on Vegan Huggs. Now it’s onto the Christmas & Hanukkah festivities. Stay tuned for more. I hope you all have a wonderful, safe & peaceful holiday. Enjoy! 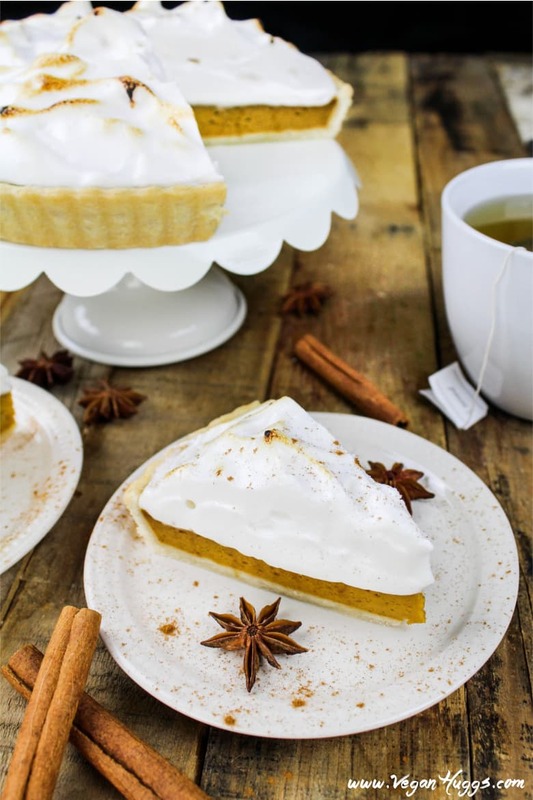 Put a little twist on tradition with this Vegan Pumpkin Meringue Pie. It will be the star at your next holiday party - It's creamy, dreamy and gorgeous! It's so easy to make, and calls for simple ingredients, too. Add flour & salt to a large bowl, whisk to combine. Using a knife or pastry cutter, cut the butter into the flour to incorporate, but don't overwork it. Add the cold water & stir until just combined, but don't over mix. You should be able to form a ball of dough now. Spread out a piece of wax paper over your work space & place dough in the middle. Place another piece of wax paper on top. Gently roll the dough using a rolling pin or wine bottle. Roll it flat & into the shape of your pie pan, and a few inches bigger. It doesn't have to be a perfect shape. Don't worry about small cracks or imperfections, they can be fixed while forming into your pan. To transfer crust to your pan, gently peel back the top layer of wax paper off your crust. Place your pie pan face down and using the wax paper, gently flip over to place the crust into the pan. Gently peel back the wax paper. Add all pie ingredients to a blender or food processor & blend until smooth. Scrape down sides as needed. Taste for seasoning & add more if needed. Pour mixture into the pie pan about 3/4 full. Place in the oven for 35-45 minutes, or until light golden brown. The filling will still be wobbly & you might see a few cracks (totally normal). Remove from oven & let completely cool on cooling rack before transferring to the fridge for 2-3 hours (loosely cover). 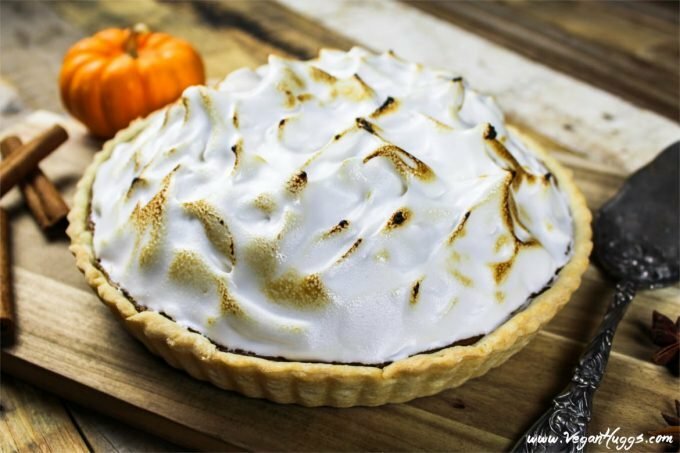 Take the pie out of the fridge & spread meringue on top using a swirling motion. You can make the meringue high or low. Have fun with it. *Optional: Using a handheld torch, lightly move flame back and forth over the meringue to toast the top. Stay about 3 inches away from the surface. Toast as much or as little as you'd like. Alternatively, you can put it under the broiler for for 1-2 minutes. Watch carefully, because it can burn fast. Serve immediately. Enjoy! *You'll need a 8-9 inch pie pan or tart pan. I use one with a removable bottom. * 2 teaspoons of pumpkin pie spice can be used in replace of the cinnamon, nutmeg, ginger & cloves. I would add 1/2 tsp more cinnamon if using the pumpkin pie spice. *COCONUT CREAM: If you don't have coconut cream, you can use a regular can of full-fat coconut milk. Just scoop the hardened part out. Save leftover liquid for smoothies or other recipes. Some brands of coconut milk don't solidify, so I recommend Native Forest, Trader Joe's and Thai Kitchen. *MERINGUE TIPS: *Make sure the mixing bowl & attachments are very clean with no oil residue. Clean with vinegar, if needed. *Cream of tartar or xanthan gum aren't completely necessary to use, but it does help the meringue hold its shape a little better & longer. * I use a balloon whip attachment, but a whisk attachment can be used too. *To check for stiff peaks, remove whisk & dip into meringue and hold whisk straight up. If the peaks fall over, continue to whip until they are firm and don't fall over. If you are looking for more holiday-ish type desserts, you might be interested in these Pumpkin Muffins W/ Cinnamon Streusel. They are moist, fluffy & scrumptious! They are perfect for Thanksgiving morning. 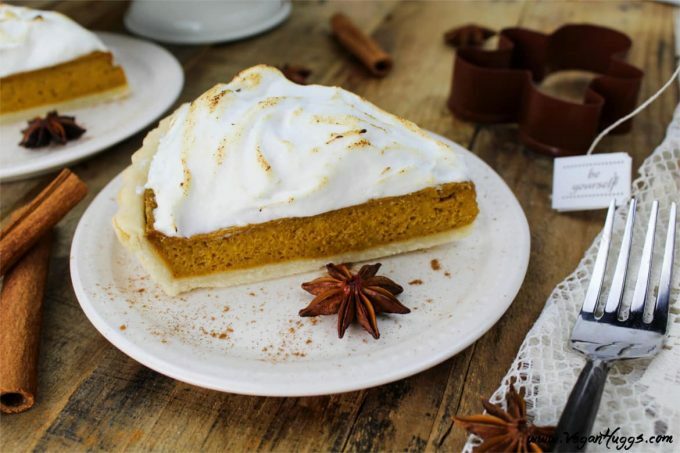 If you make this Vegan Pumpkin Meringue Pie, I’d love to hear from you. Leave a comment below and let me know what you think. It would really make my day. You can also follow me on Instagram and share your creation with me, Just tag me @veganhuggs and hashtag #veganhuggs. I love using aquafaba! Your pie looks gorgeous! This is gorgeous! It looks like a perfect dessert for Christmas! 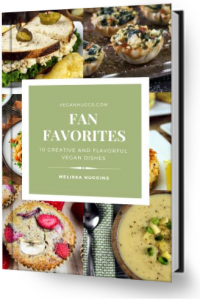 Oh my gosh, this looks so good, Melissa! Your meringue looks perfect, Melissa! This looks incredible! Love the meringue topping!